Australia Minerals & Mining Group (ASX: AKA) is closing in on producing its first samples of export quality High Purity Alumina (HPA); a material used to make a type of glass Apple just invested over half a billion dollars in. HPA is extracted from aluminous clay and used to create strong, scratch resistant and bendable ‘sapphire glass’ – a key component for smart phones, computer tablets and LCD televisions. A kilo of HPA at its highest purity can sell for up to $500. Apple recently signed a $578M deal with a sapphire glass manufacturer, GT Advanced Technology, signaling the rising interest the big electronics conglomerates have in HPA. AKA has received numerous requests for samples of its HPA from potential overseas off-take partners, ranging from manufacturers of advanced electronics and ceramics to makers of artificial sapphires and specialty precisions tools. To satisfy the demand, AKA has enlisted the help of specialist contractors who will use the company’s own extraction technology with the aim of making batches of 99.99% pure 4N HPA – a benchmark standard for the HPA industry. Overall, the effort is aimed at proving AKA’s aluminous clay (also known as kaolin) to HPA extraction method so it can press ahead with plans to create a pilot plant and move into full production. 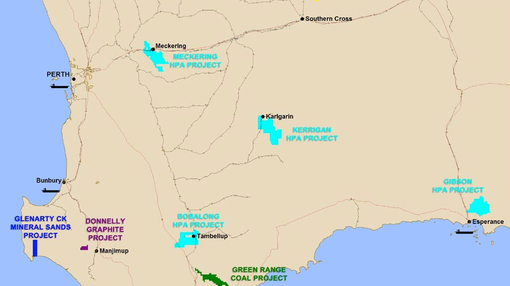 The projected 4N samples will be produced by the contractor using kaolin feedstock from AKA’s deposits in the south-west region of Western Australia. Together, these clay deposits represent a JORC resource of 297M tonnes and the company has a further exploration target of up to 3.8BN tonnes. AKA is aiming to be in full mining production of its kaolin feedstock by 2015. In addition to producing export quality samples of 4N HPA, AKA says it’s also investigating a continuous trial process where its kaolin to HPA extraction technology will be subjected to ongoing production pressure to prove its viability.